Print on chocolate is amazing to personalize gift idea for any occasion. You may want to surprise your near and dear, this is one unique concept we bring it for you. You may print just anything of your choice of photo. The chocolate we use is so tasty and healthy gourmet chocolate. The colors we use are absolutely vegetarian edible colors. After you place the order please send the order number to us along with the photo which has to be printed on the chocolate. 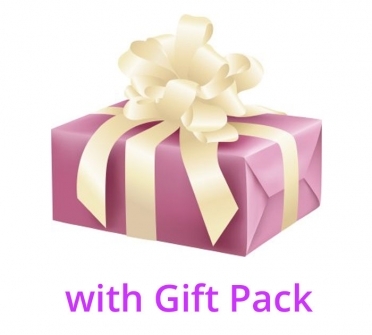 You may also send your birthday greeting choice if you have any, or else we send a gender-neutral birthday card along with the pack. Please give us maximum 7 working days to deliver the chocolate to your doorstep by reputed courier FedEx/Blue dart/ Aramex. How to upload the pic: Using below "" Custom Image "" option you may upload your choice of image. We will beautifully decorate the picture with the custom message. Custom Message: Using below "" Custom Message "", you may enter up to 30 characters which will be printed on the picture. You will get the below items along with the order: Print on Chocolate (Size 6"" x 4"") + Free chocolate samples + Birthday Greeting Card + Beautiful Gift wrap. Before we start the print, we call you to confirm the order. 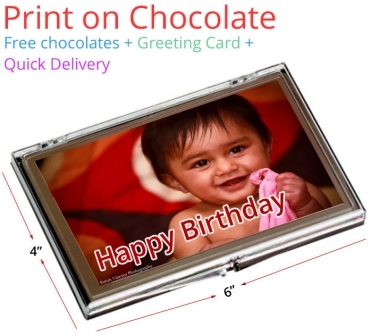 Every chocolate is handpicked and packed nicely and have lifespan up to 100 days.Some of the ideas how you may use this innovative gift.You want to wish your father on his birthday, surprise him.Surprise your mother with her beautiful photo on the chocolate, she will surely love it. Birthday gift to your wife, a birthday gift to the husband. make the birthday will be more fun, memorable and interesting. Birthday gift to children, tell them how much you love them one more time with this interesting idea. You know kids always love chocolate. Here is the regular and yet so interesting, shhhh birthday gift to your girlfriend. Show her how much you love her. Birthday gift to your boyfriend, just whisper how much he is for you with this print on chocolate. Birthday gift to your friend, enjoy the birthday with your friend. Birthday gift to your co-worker (Colleague), this will be one of the interesting corporate gifting ideas.